Does Helicopter Parenting Help Children? As parents watch their kids go through the college admissions process, the question often comes up as to how much they should be involved in their children's lives. Here's an article that may allow parents to feel less guilty when they step back and let their kids start to make more of their own decisions. According to parenting writer Bonnie Rochman, helicopter parents are doing their children a disservice: "Helicopter parenting decreased adult children’s feelings of autonomy, competence and connection. In turn, feeling incompetent led to increased reports of feeling depressed and dissatisfied." While it is important for parents to be involved in their children's lives, parents must slowly begin to take a step back as their children near adulthood. This can mean less stress for guilt-ridden parents as well: "Perhaps by choosing to watch Downton Abbey reruns instead of playing Candyland with a tot or editing college essays for a high-schooler, they’re actually building their offspring’s independence and confidence." 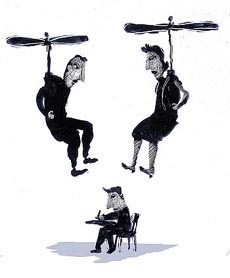 Posted in College Admissions Tips | Comments Off on Does Helicopter Parenting Help Children?